"New York International Airport" and "JFK Airport" redirect here. For New York City's other airport, see LaGuardia Airport. 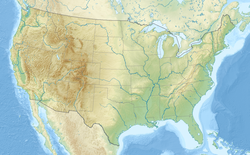 For the New York City metropolitan airport in New Jersey, see Newark Liberty International Airport. For other uses of "New York Airport", see New York Airport. For the regional airport in Wisconsin also named after John F. Kennedy, see John F. Kennedy Memorial Airport. For the airport in Bolivia, formerly officially known as JFK, see El Alto International Airport. For other uses of "KJFK" and "JFK", see KJFK (disambiguation) and JFK (disambiguation). John F. Kennedy International Airport (IATA: JFK, ICAO: KJFK, FAA LID: JFK), colloquially referred to as Kennedy Airport, New York JFK Airport, JFK Airport, New York-JFK, or simply JFK or Kennedy, is the primary international airport serving New York City. It is the busiest international air passenger gateway into North America, the 22nd-busiest airport in the world, the sixth-busiest airport in the United States, and the busiest airport in the New York airport system; it handled just over 59 million passengers in 2017. More than ninety airlines operate from the airport, with nonstop or direct flights to destinations in all six inhabited continents. 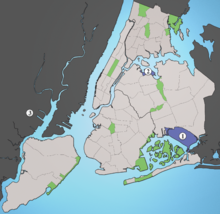 JFK is located in the Jamaica neighborhood of Queens in New York City, 16 miles (26 km) southeast of Midtown Manhattan. The airport features six passenger terminals and four runways. It serves as a hub for both American Airlines and Delta Air Lines, and it is the primary operating base for JetBlue Airways. JFK was also formerly a hub for Pan Am, TWA, Eastern, National, and Tower Air. The facility opened in 1948 as New York International Airport and was commonly known as Idlewild Airport. Following John F. Kennedy's assassination in 1963, the airport was renamed John F. Kennedy International Airport as a tribute to the 35th President. John F. Kennedy International Airport was originally called Idlewild Airport (IATA: IDL, ICAO: KIDL, FAA LID: IDL) after the Idlewild Beach Golf Course that it displaced. It was built to relieve LaGuardia Airport, which had become overcrowded after its 1939 opening. Construction began in 1943, and about US$60 million was initially spent with governmental funding, but only 1,000 acres (400 ha) of the Idlewild Golf Course site were earmarked for use. In 1943, the project was renamed Major General Alexander E. Anderson Airport, after a Queens resident who had commanded a Federalized National Guard unit in the southern United States and died in late 1942. In March 1948, the New York City Council changed the name to New York International Airport, Anderson Field, but the common name was "Idlewild" until the end of 1963. The Port of New York Authority (now the Port Authority of New York and New Jersey) leased the Idlewild property from the City of New York in 1947 and maintains this lease today. The first flight from Idlewild was on July 1, 1948; the opening ceremony was attended by then U.S. President Harry S. Truman. The Port Authority canceled foreign airlines' permits to use LaGuardia, forcing them to move to Idlewild during the next couple of years. Idlewild opened with six runways and a seventh under construction; runways 1L and 7L were held in reserve and never came into use as runways. Runway 31R (originally 8,000 ft or 2,438 m) is still in use; runway 31L (originally 9,500 ft or 2,896 m) opened soon after the rest of the airport and is still in use; runway 1R closed in 1957 and runway 7R closed around 1966. Runway 4 (originally 8,000 ft, now runway 4L) opened June 1949 and runway 4R was added ten years later. A smaller runway 14/32 was built after runway 7R closed and was used until 1990 by general aviation, STOL, and smaller commuter flights. The Avro Jetliner was the first jet airliner to land at Idlewild on April 16, 1950. A Sud Aviation Caravelle prototype was the next airliner to land at Idlewild, on May 2, 1957. Later in 1957, the USSR sought approval for two Tupolev Tu-104 flights carrying diplomats to Idlewild; the Port Authority did not allow them, saying noise tests had to be done first. (The Caravelle had been tested at Paris.) The airport was renamed John F. Kennedy International Airport on December 24, 1963, a month and two days after the assassination of President John F. Kennedy; Mayor Robert F. Wagner, Jr. proposed the renaming to JFK. The IDL and KIDL codes have since been reassigned to Indianola Municipal Airport in Mississippi. The Port of New York Authority originally planned a single 55-gate terminal, but the major airlines did not agree with this plan, arguing that the terminal would be far too small for future traffic. Architect Wallace Harrison then designed a plan for each major airline at the airport to be given its own space to develop its own terminal. This scheme made construction more practical, made terminals more navigable, and introduced incentives for airlines to compete with each other for the best design. The revised plan met airline approval in 1955, with seven terminals initially planned. Five terminals were for individual airlines, one was for three airlines, and one was for international arrivals. (National Airlines and British Airways arrived later.) The airport was designed for aircraft up to 300,000-pound (140,000 kg) gross weight The airport had to be modified in the late 1960s to accommodate the Boeing 747's weight. The International Arrivals Building, or IAB, was the first new terminal at the airport, opening in December 1957. The building was designed by Skidmore, Owings and Merrill. The terminal stretched nearly 700 meters (2,300 ft) and was parallel to runway 7R. The terminal had "finger" piers at right-angles to the main building allowing more aircraft to park, an innovation at the time. The building was expanded in 1970 to accommodate jetways. However, by the 1990s the overcrowded building was showing its age and it did not provide adequate space for security checkpoints. It was demolished in 2000 and replaced with Terminal 4. United Airlines and Delta Air Lines opened Terminal 7 (later renumbered Terminal 9), a Skidmore design similar to the IAB, in October 1959. It was demolished in 2008. Eastern Airlines opened their Chester L. Churchill-designed Terminal 1 in November 1959. The terminal was demolished in 1995 and replaced with the current Terminal 1. American Airlines opened Terminal 8 in 1960. It was designed by Kahn and Jacobs and had a 317-foot (97 m) stained-glass façade designed by Robert Sowers, the largest stained-glass installation in the world until 1979. The façade was removed in 2007 as the terminal was demolished to make room for the new Terminal 8; American cited the prohibitive cost of removing the enormous installation. Trans World Airlines opened the TWA Flight Center in 1962, designed by Eero Saarinen with a distinctive winged-bird shape. With the demise of TWA in 2001, the terminal remained vacant until 2005 when JetBlue Airways and the Port Authority of New York and New Jersey (PANYNJ) financed the construction of a new 26-gate terminal partly encircling the Saarinen building. Called Terminal 5(Now T5), the new terminal opened October 22, 2008. T5 is connected to the Saarinen central building through the original passenger departure-arrival tubes that connected the building to the outlying gates. The Port Authority is working on restorations to the remaining original Saarinen terminal, also known as the head house. Northwest Airlines, Braniff International, and Northeast Airlines opened a joint terminal in 1962 (now Terminal 2). National Airlines opened the Sundrome (now Terminal 6) in 1970. The terminal was designed by I.M.Pei. It was unique for its use of all-glass mullions dividing the window sections, unprecedented at the time. In 2001, United Airlines planned to redevelop this terminal and the TWA Flight Center as a new United terminal. 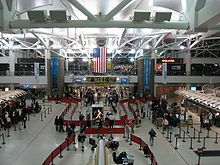 Terminal 6 was used by JetBlue Airways from 2001 through 2008, and then was vacated and demolished when JetBlue Airways moved to Terminal 5. Airlines began scheduling jets to Idlewild in 1958–59; LaGuardia did not get jets until 1964, and Idlewild became New York's busiest airport. It had more airline takeoffs and landings than LaGuardia and Newark combined from 1962 to 1967 and was the second-busiest airport in the country, peaking at 403,981 airline operations in 1967. LaGuardia received a new terminal and longer runways from 1960 to 1966. By the mid- 1970s, the two airports had roughly-equal airline traffic (by flight count); Newark was in third place until the 1980s, except during LaGuardia's reconstruction. The Concorde, operated by Air France and British Airways, made scheduled trans-Atlantic supersonic flights to JFK from November 22, 1977 until its retirement by British Airways on October 24, 2003. Air France had retired the aircraft in May 2003. Construction of the AirTrain JFK rapid-transit system began in 1998, after decades of planning for a direct rail link to the airport. Although the system was originally scheduled to open in 2002, it opened on December 17, 2003 after delays caused by construction and a fatal crash. The rail network links each airport terminal to the New York City Subway and the Long Island Rail Road at Howard Beach and Jamaica. The airport's new Terminal 1 opened on May 28, 1998; Terminal 4, the $1.4 billion replacement for the International Arrivals Building, opened on May 24, 2001. JetBlue's Terminal 5 incorporates the TWA Flight Center, and Terminals 8 and 9 were demolished and rebuilt as Terminal 8 for the American Airlines hub. The Port Authority Board of Commissioners approved a $20 million planning study for the redevelopment of Terminals 2 and 3, the Delta Air Lines hub, in 2008. On March 19, 2007, JFK was the first airport in the United States to receive a passenger Airbus A380 flight. The route, with an over-500-passenger capacity, was operated by Lufthansa and Airbus and arrived at Terminal 1. On August 1, 2008, it received the first regularly-scheduled commercial A380 flight to the United States (on Emirates' New York–Dubai route) at Terminal 4. Although the service was suspended in 2009 due to poor demand, the aircraft was reintroduced in November 2010. Other airlines operating A380s to JFK include Singapore Airlines (on its New York–Frankfurt–Singapore route), Air France (on its New York–Paris–Charles de Gaulle route), Lufthansa (on its New York–Frankfurt route), Korean Air and Asiana Airlines (on their New York–Seoul route) and Etihad Airways on its New York–Abu Dhabi route. On December 8, 2015, JFK was the first U.S. airport to receive a commercial Airbus A350 flight when Qatar Airways began using the aircraft on its New York–Doha route. On August 14, 2016, at 9:31 pm, gunfire was reported at Terminal 8; shortly afterward, gunfire was also reported at Terminal 1. An investigation indicated that no shooting had occurred, but frightened travelers ran from the terminals onto nearby highways and runways. The terminals were temporarily shut down, and flights were rerouted. Police, who were investigating, learned that the reported gunshots were travelers clapping for Usain Bolt after he won the men's 100-meter dash at the 2016 Summer Olympics. Two people were injured in the resulting stampede, and the Port Authority Police Department later reviewed its strategy for dealing with possible terror attacks. On January 4, 2017, the office of New York governor Andrew Cuomo announced a plan to renovate the airport at a cost of $7 to 10 billion. The Airport Master Plan Advisory Panel had reported that JFK, 59th out of the world's top 100 airports, was expected to experience severe capacity constraints from increased use. The airport was expected to serve about 75 million annual passengers in 2020 and 100 million by 2050, up from 60 million when the report was published. The panel had several recommendations, including enlarging the newer terminals; relocating older terminals; reconfiguring highway ramps and increasing the number of lanes on the Van Wyck Expressway; lengthening AirTrain JFK trainsets or connecting the line to the New York City transportation system, and rebuilding the Jamaica station with direct connections to the Long Island Rail Road and the New York City Subway. No start date has yet been proposed for the project; in July 2017, Cuomo's office began accepting proposals for master plans to renovate the airport. In October 2018, Cuomo released details of a $13 billion plan to rebuild passenger facilities and approaches to JFK Airport. Two new international terminals would be added. One of the terminals, a $7 billion, 23-gate structure replacing terminals 1 and 2 and connecting to Terminal 4, would be financed and built by a partnership between Lufthansa, Air France, Korean Airlines, and Japan Airlines. The other terminal, costing $3 billion, would be developed by JetBlue and will replace Terminal 7 and the vacant space of Terminal 6, and would connect to Terminal 5. Terminal 8 would remain a separate terminal operating American Airlines and Oneworld flights. JFK's redesign will include adding cars to AirTrain trainsets; widening connector ramps between the Van Wyck Expressway and Grand Central Parkway in Kew Gardens; and adding another lane in each direction to the Van Wyck, at a combined cost of $1.5 billion. If approved, construction is expected to begin in 2020. Under the plan, the first gates would open in 2023, and the project would be complete in 2025. JFK has six terminals, containing 128 gates, numbered 1–8 but skipping terminals 3 (demolished in 2013) and 6 (demolished in 2011). The terminal buildings, with the exception of the former Tower Air terminal, are arranged in a deformed U-shaped wavy pattern around a central area containing parking, a power plant and other airport facilities. The terminals are connected by the AirTrain system and access roads. Directional signage throughout the terminals was designed by Paul Mijksenaar. A 2006 survey by J.D. Power and Associates in conjunction with Aviation Week found JFK ranked second in overall traveler satisfaction among large airports in the United States, behind McCarran International Airport, which serves the Las Vegas metropolitan area. Until the early 1990s, each terminal was known by the primary airline that served it, except for Terminal 4, which was known as the International Arrivals Building. In the early 1990s, all of the terminals were given numbers except for the Tower Air terminal, which sat outside the Central Terminals area and was not numbered. Like in the other airports controlled by the Port Authority, terminals are sometimes managed and maintained by independent terminal operators. At JFK, all terminals are currently managed by airlines or consortiums of the airlines serving them, with the exception of the Schiphol Group-operated Terminal 4. All terminals except Terminal 2 can handle international arrivals that are not pre-cleared. Most inter-terminal connections require passengers to exit security, then walk, use a shuttle-bus or using the AirTrain JFK to get to the other terminal, then re-clear security. Terminal 1 opened in 1998, 50 years after the opening of JFK, at the direction of the Terminal One Group, a consortium of four key operating carriers: Air France, Japan Airlines, Korean Air, and Lufthansa. This partnership was founded after the four airlines reached agreement that the then-existing international carrier facilities were inadequate for their needs. Terminal 1 is served by SkyTeam carriers Aeroflot, Air France, Alitalia, China Eastern Airlines, Korean Air, and Saudia; Star Alliance carriers Air China, Austrian Airlines, Brussels Airlines, EVA Air, Lufthansa, and Turkish Airlines; and Oneworld carrier Japan Airlines. Other airlines serving terminal 1 include Air Italy, Azerbaijan Airlines, Cayman Airways, Norwegian Air, Philippine Airlines, Royal Air Maroc, and VivaAerobus. Terminal 1 was designed by William Nicholas Bodouva + Associates. It and Terminal 4 are the two terminals at JFK Airport with the capability of handling the Airbus A380 aircraft, which are flown by Air France on the route from Paris–Charles De Gaulle, by Lufthansa on the route from Frankfurt Airport, and by Korean Air on the route from Seoul–Incheon. Air France operated Concorde here until 2003. Terminal 1 has 11 gates. Terminal 2 opened in 1962 as the home of Northeast Airlines, Braniff, and Northwest Airlines, and is now exclusively used and operated by Delta Air Lines. After the demise of Northeast Airlines and Braniff, the terminal was taken over by Pan American World Airways and subsequently by Delta. Since the opening of the Terminal 4 addition in May 2013, Terminal 2 has been designated as the "C" gates by Delta and has 11 Jetway-equipped gates (C60-C70). Terminal 2 used to house the majority of Delta's operations, but after the opening of the Terminal 4 addition, the majority of flights are now handled out of the latter. International and flights to LAX, SFO, and SEA check-in at Terminal 4. Terminal 4, developed by LCOR, Inc., is managed by JFK International Air Terminal (IAT) LLC, a subsidiary of the Schiphol Group. This terminal serves as a major international hub for Delta Air Lines (and domestic flights to Los Angeles, San Francisco, and Seattle-Tacoma) and was the first one in the United States to be managed by a foreign airport operator. Terminal 4 is the major gateway for international arrivals at JFK. Airlines providing service at Terminal 4 include SkyTeam carriers Aeromexico, Air Europa, China Airlines, Delta Air Lines, Kenya Airways, KLM, and Xiamen Airlines; Star Alliance carriers Air India, Asiana Airlines, Avianca, Copa Airlines, EgyptAir, Singapore Airlines, South African Airways, and Swiss International Air Lines; and non-alliance carriers Air Serbia, Caribbean Airlines, China Southern Airlines, El Al, Emirates, Etihad Airways, JetBlue (late night international arrivals only), Kuwait Airways, Sun Country Airlines, Thomas Cook Airlines, Uzbekistan Airways, Virgin Atlantic, Volaris, WestJet, and XL Airways. Opened in 2001 and designed by Skidmore, Owings and Merrill, the 1,500,000-square-foot (140,000 m2) terminal was built at a cost of $1.4 billion and replaced JFK's old International Arrivals Building or simply IAB, which opened in 1957. The terminal was expanded in the late 2000s and early 2010s. The first phase of Delta's $1.4 billion project at the airport—which includes nine new international gates, additional baggage space, a centralized security checkpoint (moving two checkpoints into one location just after check-in), and customs and border-security facilities—was completed on May 24, 2013. Terminal 4 has 38 gates in two concourses: A2–A7, B18, B22–B55 with the exclusion of B40, B50 and B52. As of 2013, Delta and the Port Authority of New York and New Jersey agreed to an additional $175 million phase II expansion, which allowed Delta to construct 11 regional jet gates at Terminal 4, as well. The agreement allowed Delta to eliminate a proposed physical connection that it has previously planned to build with its existing Terminal 2 and instead close T2 eventually. The work on the Delta hub was completed in January 2015, with funding primarily from $900 million in special-project bonds. Delta sought funding for the regional jet expansion from the New York City Industrial Development Agency. As Terminal 4 was built during the construction of the AirTrain, the AirTrain station was built inside the terminal building. Other AirTrain stations are built across from terminal buildings. Delta Air Lines has also moved much of its operations to T4, as it expands operations beyond T2, with T3 now closed. Concourse A serves as the stopping location for Asian and some European airlines, whereas Concourse B is made up of Delta flights, and a number of Asian and some European airlines. Like Terminal 1, it is Airbus A380-compatible and Asiana Airlines (to Seoul), Emirates (to Dubai; both non-stop and one-stop flights via Milan), Etihad Airways (to Abu Dhabi) and Singapore Airlines (to Singapore via Frankfurt) currently use Terminal 4 for their Airbus A380s. A variety of other airlines from across the globe as well as SkyTeam and Star Alliance utilize the terminal as well. Terminal 5 opened in 2008 for JetBlue Airways, the manager and primary (then only) tenant of the building, as the base of its large JFK hub. The terminal is also used by Hawaiian Airlines, which partnered with JetBlue and began service to/from Honolulu in Terminal 5 in June 2012, TAP Air Portugal flights to/from Lisbon, Cape Air flights to/from Hyannis and Nantucket, and Irish flag carrier Aer Lingus, whose flights arriving into JFK from Dublin and Shannon Airport have already been pre-cleared in Ireland. Aer Lingus previously used Terminal 4 prior to the introduction of pre-clearance in Ireland, moving to Terminal 5 on April 3, 2013. On November 12, 2014, JetBlue opened the International Arrivals Concourse (T5i) at the terminal. TAP Air Portugal has used Terminal 5 since reinstating its JFK–Lisbon service on July 1, 2016. The terminal was redesigned by Gensler and constructed by Turner Construction, and sits behind the preserved Eero Saarinen-designed terminal originally known as the TWA Flight Center, which is now connected to the new structure and is considered part of Terminal 5. Currently closed for refurbishment, the Saarinen building is planned to reopen in 2018 as a hotel. The active Terminal 5 building has 29 gates: 1 through 12 and 14 through 30, with gates 25 through 30 handling international flights that are not pre-cleared (gates 28–30 opened in November 2014). Airspace Lounge opened an airport lounge near Gate 24 in July 2013, and Aer Lingus opened an airport lounge in 2015. In August 2016, Fraport USA was selected by JetBlue as the concessions developer to help attract and manage concessions tenants that align with JetBlue's vision for Terminal 5. During the summer of 2016, JetBlue renovated Terminal 5, completely overhauling the check-in lobby. Terminal 7 was designed by GMW Architects and built for BOAC and Air Canada in 1970. Currently operated by British Airways, it is also the only airport terminal operated on US soil by a foreign carrier, although Terminal 1 is operated by a consortium of foreign carriers serving the building. Airlines operating out of Terminal 7 include Oneworld alliance carriers British Airways, Iberia, and Qatar Airways (AM flights), Star Alliance carriers All Nippon Airways and LOT Polish Airlines, SkyTeam member Aerolíneas Argentinas, and non-alliance carriers Alaska Airlines, Eurowings, Interjet, Icelandair, and Ukraine International Airlines. Between 1989 and 1991, the terminal was renovated and expanded at a cost of $120 million. The expansion was designed by William Nicholas Bodouva + Associates, Architects. In 1997, the Port Authority approved British Airways' plans to renovate and expand the terminal. The $250 million project was designed by Corgan Associates and was completed in 2003. The renovated terminal has 12 gates. In 2015, British Airways extended its lease on the terminal through 2022, with an option of a further three years. BA also plans to spend $65 million to renovate the terminal. Despite being operated by British Airways, a major A380 operator, Terminal 7 is not currently able to handle the aircraft type. As a result, British Airways cannot operate A380s on the lucrative London-Heathrow to New York flights. Terminal 8 is a major Oneworld hub with American Airlines being the main Oneworld carrier. In 1999, American Airlines began an eight-year program to build the largest passenger terminal at JFK, designed by DMJM Aviation to replace both Terminal 8 and Terminal 9. The new terminal was built in four phases, which involved the construction of a new midfield concourse and demolition of old Terminals 8 and 9. It was opened in stages between 2005 and its "official" opening in August 2007. American Airlines is the largest carrier in and manager of the terminal and is the third largest carrier at JFK. Some Oneworld airlines that operate out of Terminal 8 include Cathay Pacific, Finnair, LATAM Brasil, LATAM Chile, Qantas, Qatar Airways, and Royal Jordanian Airlines. British Airways and Iberia plan to move into Terminal 8 by the end of 2022 following its renovation and expansion. The terminal is twice the size of Madison Square Garden. It offers dozens of retail and food outlets, 84 ticket counters, 44 self-service kiosks, 10 security checkpoint lanes and a U.S. Customs and Border Protection facility that can process more than 1,600 people an hour. Terminal 8 has an annual capacity of 12.8M passengers. It has two American Airlines Admirals Clubs and a Flagship Lounge for premium class passengers. Terminal 8 has 29 gates: 12 gates in Concourse B (1–8, 10, 12, 14 and 16) and 17 gates in Concourse C (31–47). Gate 31 is further subdivided into 5 regional service gates for small jets, 31A–31E. Gate 32 is subdivided into 4 regional service gates for small jets, 32F–32I. The total number of jetbridges is, therefore, 36. Passenger access to Concourse C is by an underground tunnel that includes moving walkways. JFK Airport was originally built with ten terminals, compared to the six it has today. Ten terminals remained until the late 1990s, then nine remained until the early 2000s, followed by eight until 2011 and seven until May 2013. This terminal opened in 1959 and was demolished in 1995 after the collapse of Eastern Air Lines in 1991. The terminal was on the site of today's Terminal 1. Terminal 3 was built as the Worldport in 1960 for Pan American; it expanded after the introduction of the 747 in 1970. After Pan Am's demise in 1991 Delta Air Lines took over ownership of the terminal and was its only occupant until its closure in 2013. It had a connector to Terminal 2, Delta's other terminal. Terminal 3 had 16 Jetway equipped gates: 1–10, 12, 14–18 with two hardstand gates (Gate 11) and a helipad on Taxiway 'KK'. A $1.2 billion project was completed in 2013, under which Terminal 4 was expanded and with Delta subsequently moving its T3 operations to T4. On May 23, 2013, the final departure from the terminal, Delta Air Lines Flight 268, a Boeing 747-400 to Tel Aviv Ben Gurion Airport, departed from Gate 6 at 11:25 p.m. local time. The terminal ceased operations on May 24, 2013, 53 years to the day from when it opened on May 24, 1960. Demolition began soon thereafter and was completed by Summer 2014. The site where Terminal 3 used to stand is now used for aircraft parking by Delta Air Lines. There has been large media outcry, particularly in other countries, over the demolition of the Worldport. Several online petitions requesting the restoration of the original 'flying saucer' gained popularity. Terminal 6 had 14 gates. Designed by I. M. Pei, it was built in 1970 as the National Airlines Sundrome. Later, Trans World Airlines used it. In 2000, JetBlue Airways began service from Terminal 6, later opening a temporary complex in 2006 that increased its capacity by adding seven gates. After JetBlue vacated the terminal, it was demolished. The international arrivals annex of Terminal 5 now uses a portion of the site, and the rest of the site is used for aircraft parking by both JetBlue and British Airways (which operates from nearby Terminal 7). The original Terminal 8 opened in 1960; its stained-glass façade was the largest in existence at the time. It was always used by American Airlines and in later years it was used by other Oneworld airlines that did not use Terminal 7. Terminal 9 opened in 1959 and was used by United Airlines and Delta Air Lines. Delta moved to Terminal 2 when they acquired Northeast Airlines. Braniff International moved from Terminal 2 to Terminal 9 in 1973, and operated in Terminal 9 until its bankruptcy in 1982. United used Terminal 9 from its opening in 1959 until it vacated the terminal in 1991 and became a tenant at British Airways' Terminal 7. Terminal 9 then became the home of American Airlines' domestic operations and American Eagle flights for the remainder of its life. The terminals were demolished in the early-to-mid-2000s and replaced with a new Terminal 8. The Tower Air terminal, unlike other terminals at JFK airport, sat outside the Central Terminals area in Building 213 in Cargo Area A. Originally used by Pan Am until the expansion of the Worldport (later Terminal 3), it was later used by Tower Air and TWA shuttle until the airline was acquired by American Airlines in 2001. Building 213 has not been used since 2000. It is located next to the Delta Air Lines employees' parking lot number 7, which was once the Tower Air terminal parking lot. 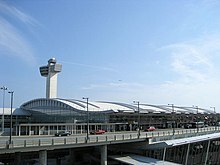 John F. Kennedy International Airport spans 5,200 acres or 21 square kilometers (8.1 sq mi). There are four runways (two pairs of parallel runways) surrounding the airport's central terminal area. 13R/31L 14,511 feet (4,423 m) 200 feet (61 m) Cat. I (31L) Third-longest commercial runway in North America (the longest is a 16,000-foot (4,900 m) runway at Denver International Airport. Second is a 14,512-foot (4,423 m) runway at Las Vegas International.) Adjacent to Terminals 1, 2, and 3. Handled approximately one half of the airport's scheduled departures. It was a backup runway for space shuttle missions. It was closed on March 1, 2010 for four months. The reconstruction of the runway widened it from 150 to 200 feet (46 to 61 m) with a concrete base instead of asphalt. It reopened on June 29, 2010. 4R/22L 8,400 feet (2,560 m) 200 feet (61 m) Cat. III (both directions) Equipped at both ends with Approach Lighting Systems (ALS) with sequenced flashers, and touchdown zone (TDZ) lighting. The first Engineered Materials Arresting System (EMAS) in North America was installed at the northeast end of the runway in 1996. The bed consists of cellular cement material, which can safely decelerate and stop an aircraft that overruns the runway. The arrestor bed concept was originated and developed by the Port Authority and installed at JFK Airport as a joint research and development project with the FAA and industry. 4L/22R 12,079 feet (3,682 m) 200 feet (61 m) Cat. I (both directions) Adjacent to Terminals 4 and 5. Both ends allow instrument landings down to three-quarters of a mile's visibility. Takeoffs can be conducted with one-eighth of a mile's visibility. It closed on June 1, 2015 for almost 4 months as part of a major runway modernization project that replaced the asphalt base with a concrete base and widened the runway from 150 feet to 200 feet. It reopened on September 28, 2015. 13L/31R 10,000 feet (3,048 m) 150 feet (46 m) Cat. II (13L); Cat. I (31R) Adjacent to Terminals 5 and 7. Equipped at both ends with ILS and ALS systems. Runway 13L has two additional visual aids for landing aircraft, a Precision Approach Path Indicator (PAPI) and a Lead-In Lighting System (LDIN). The ILS on 13L, along with TDZ lighting, allows landings down to half a mile's visibility. Takeoffs can be made with visibility of one-eighth of a mile. Looking at runway 4L/22R and out to sea. JFK has over 25 miles (40 km) of taxiways to move aircraft in and around the airfield. The standard width of these taxiways is 75 feet (23 m), with 25 feet (7.6 m) heavy-duty shoulders and 25-foot (7.6 m) erosion control pavements on each side. The taxiways have centerline lights and are generally of asphalt concrete composition 15 to 18 inches (380 to 460 mm) thick. An illuminated sign system provides directional information for taxiing aircraft. The Air Traffic Control Tower, designed by Pei Cobb Freed & Partners and constructed on the ramp-side of Terminal 4, began full FAA operations in October 1994. An Airport Surface Detection Equipment (ASDE) radar unit sits atop the tower. A gas-fired electric cogeneration plant generates electricity for the airport, with an output of about 90 megawatts. It uses thermal energy from the capture of waste heat to heat and cool all of the passenger terminals and other facilities in the central terminal area. At the time of its completion, the JFK tower, at 320 feet (98 m), was the world's tallest control tower. It was subsequently displaced from that position by towers at other airports in both the United States and overseas, including those at Hartsfield–Jackson Atlanta International Airport, currently the tallest tower at any U.S. airport, at 398 feet (121 m) and at KLIA2 in Kuala Lumpur, Malaysia, currently the world's tallest control tower at 438 feet (134 m). Aircraft service facilities include seven aircraft hangars, an engine overhaul building, a 32-million-US-gallon (120,000 m3) aircraft fuel storage facility and a truck garage. In the last few years, improvements have been made to terminals, roadways and inter-terminal transportation. North American Airlines had its headquarters in Building 141 along Federal Circle, on the airport property. North American Airlines was one of the building's tenants; the building does have Servisair and VOA as tenants and Port Authority storage. Building 141 was originally a Port Authority of New York and New Jersey (PANYNJ) administration building. In the 1990s it served as the PANYNJ police headquarters. In 2000 an $800,000, 5,000-square-foot (460 m2) annex of the building opened to serve students of Aviation High School in Long Island City. In 2003 Building 141 was dedicated in honor of Morris Sloane, a PANYNJ aviation employee. Hangar 17, originally occupied by Pan American and later Tower Air, found a new and important role housing artifacts from 9/11 that eventually made their way to the 9/11 Museum at Ground Zero. Servisair has its offices in Building 86. CAL Cargo Airlines has its offices in Building 23. Currently Nippon Cargo Airlines has its New York City branch in Cargo Building 66. Previously Overseas National Airways (ONA) had its headquarters at the airport. When Tower Air existed, its head offices were in Building 178 and later in Hangar 17 at JFK Airport. When Metro International Airways existed, its head office was in Building 178. The Port Authority of New York and New Jersey Police Department (PAPD) provides law enforcement, fire rescue and emergency medical services to the airport. Its JFK Command is based in Building 269. PANYNJ operations and administrative offices are located in Building 14. Three chapels, including Our Lady of the Skies Chapel, provide for the religious needs of airline passengers. Sheltair is the current FBO on the field serving General Aviation traffic. The company became the first privately operated FBO at JFK Airport in its 65-year history when it opened on May 21, 2012. In January 2017, the Ark at JFK Airport, a luxury terminal for pets, opened at a cost of $65 million. Ark was built ostensibly so that people who were transporting pets and other animals would be able to provide luxurious accommodations for these animals. At the time, it was supposed to be the only such facility in the U.S. However, in January 2018, Ark's owner sued the Port Authority for violating a clause that would have given Ark the exclusive rights to inspect all animals who arrive at JFK from other countries. In the lawsuit, the owner stated that Ark had incurred large operational losses because many animals were instead being transported to a United States Department of Agriculture facility in Newburgh. The airport's International Mail Facility. In the immediate vicinity of the airport, parking and other information can be obtained by tuning to a highway advisory radio station at 1630 AM. A second station at 1700 AM provides information on traffic concerns for drivers leaving the airport. Kennedy Airport, along with the other Port Authority airports (LaGuardia and Newark), uses a uniform style of signage throughout the airport properties. Yellow signs direct passengers to airline gates, ticketing and other flight services; green signs direct passengers to ground transportation services and black signs lead to restrooms, telephones and other passenger amenities. In addition, the Port Authority operates "Welcome Centers" and taxi dispatch booths in each airline terminal, where staff provide customers with information on taxis, limousines, other ground transportation and hotels. New York City traffic reporter Bernie Wagenblast provides the voice for the airport's radio stations and the messages heard on board AirTrain JFK and in its stations. There are several hotels adjacent to JFK Airport, including the Courtyard by Marriott and the Crowne Plaza. The former Ramada Plaza JFK Hotel is Building 144, and it was the only on-site hotel at JFK Airport. It was previously a part of Forte Hotels and previously the Travelodge New York JFK. Due to its role in housing friends and relatives of aircraft crashes in the 1990s and 2000s, the hotel became known as the "Heartbreak Hotel". In 2009 the PANYNJ stated in its preliminary 2010 budget that it was closing the hotel due to "declining aviation activity and a need for substantial renovation" and that it expected to save $1 million per month. The hotel closed on December 1, 2009. Almost 200 employees lost their jobs. As of 2009, the Port Authority hoped to build a new hotel on the airport property. On July 27, 2015, Governor Andrew Cuomo announced in a press conference that the TWA Flight Center building would be used by the TWA Hotel, a 505-room hotel with 40,000 square feet of conference, event, or meeting space. The new hotel is estimated to cost $265 million and open in 2019. The public will be able to visit the hotel's 10,000-square-foot observation deck. Groundbreaking for the hotel occurred on December 15, 2016. ^a Flights from London–City to New York–JFK have a stopover in Shannon for refueling due to weight restrictions in LCY. However, British Airways does not carry local traffic between Shannon and New York. The flight from New York to London is non-stop. This flight is flown by an Airbus A318. ^b Qantas flies from New York to Sydney as QF12 with a stop-over in Los Angeles, where passengers will have the option to connect onto the airline's flights to Brisbane and Melbourne. Although the same flight number continues to Sydney there is an aircraft swap at Los Angeles from an 787 Dreamliner to an A380 (the 787 continues to Brisbane). Furthermore, the airline does not have eighth freedom rights to solely transport passengers between New York and Los Angeles due to regulations by the United States government. ^c This flight on its return journey has a technical stop in Vienna. Air India does not have fifth freedom rights to solely transport passengers between Vienna and New York. The outbound to Delhi is nonstop. When ranked by the value of shipments passing through it, JFK is the number three freight gateway in the United States (after the Port of Los Angeles and the Port of New York and New Jersey), and the number one international air freight gateway in the United States. Almost 21% of all U.S. international air freight by value and 9.6% by tonnage moved through JFK in 2008. The JFK air cargo complex is a Foreign Trade Zone, which legally lies outside the customs area of the United States. JFK is a major hub for air cargo between the United States and Europe. London, Brussels and Frankfurt are JFK's three top trade routes. The European airports are mostly a link in a global supply chain, however. The top destination markets for cargo flying out of JFK in 2003 were Tokyo, Seoul and London. Similarly, the top origin markets for imports at JFK were Seoul, Hong Kong, Taipei and London. Nearly 100 cargo air carriers operate out of JFK, among them: Air China Cargo, ABX Air, Asiana, Atlas Air, CAL Cargo Air Lines, Cargolux, Cathay Pacific Cargo, China Airlines, EVA Air, Emirates SkyCargo, Nippon Cargo Airlines, FedEx Express, DHL Air UK, Kalitta Air, Korean Air, Lufthansa Cargo, UPS Airlines, Southern Air and World Airways. Top 5 carriers together transported 33.1% of all "revenue" freight in 2005: American Airlines (10.9% of the total), FedEx Express (8.8%), Lufthansa Cargo (5.2%), Korean Air Cargo (4.9%), China Airlines (3.8%). Most cargo and maintenance facilities at JFK are located north and west of the main terminal area. DHL, FedEx Express, Japan Airlines, Lufthansa, Nippon Cargo Airlines and United Airlines have cargo facilities at JFK. In 2000, Korean Air Cargo opened a new $102 million cargo terminal at JFK with total floor area of 81,124 square feet (7,536.7 m2) and capability of handling 200,000 tons annually. In 2007, American Airlines opened a new priority parcel service facility at their Terminal 8, featuring 30-minute drop-offs and pick-ups for priority parcel shipments within the US. In 2015, JFK Airport handled 56,827,154 revenue passengers, which was a 2.3% increase over 2014. 2013 marked the first time JFK Airport handled more than 50 million passengers in one year. The airport contributes about $30.1 billion in economic activity to the New York City region, generating 229,000 jobs and about $9.8 billion in wages and salaries. About 35,000 people are employed at the airport. Nearly 100 airlines from over 50 countries operate regularly scheduled flights from JFK Airport. The New York-JFK to London–Heathrow route is the leading U.S. international airport pair with over 2.6 million passengers in 2011. Domestic travel also accounts for a large share of airport traffic, particularly transcontinental and Florida service. JFK Airport is connected to New York City Subway and Long Island Rail Road by AirTrain JFK. It stops at all terminals, parking lots, hotel shuttle areas, car rental lots, the Jamaica LIRR station, Howard Beach-JFK Airport subway station on the IND Rockaway Line (A train) and Sutphin Boulevard–Archer Avenue–JFK Airport subway station on the Archer Avenue Line (E​, ​J, and ​Z trains). A Lower Manhattan–Jamaica/JFK Transportation Project has been proposed to connect the AirTrain to Lower Manhattan. NYC Airporter is the only permitted and official operator of express airport bus service for the New York City Department of Transportation and Port Authority of New York and New Jersey (the airports' operator). Several city bus lines link JFK to the New York City Subway and Long Island Rail Road, including the Q3, Q6, Q7, Q10, B15, with free transfers provided for subway connections. The B15, Q3 and Q10 buses all serve the Central Terminal Area via a dedicated bus stop at the former Terminal 6 (connection to other terminals via AirTrain JFK, with a direct walkway provided to Terminal 5), while the Q6 serves only eastern Cargo Area D and the USPS Airport Mail facility and the Q7 serves only Cargo Area C. There are also many private bus lines operating express buses to Manhattan, the Hudson Valley and Long Island. The Port Authority provides free shuttle-bus service between the Federal Circle AirTrain station and the airport's cargo areas, as well as within the long-term and Port Authority-operated employee parking lots. These buses are operated by Servisair under contract. New York City's yellow cabs, licensed by the New York City Taxi & Limousine Commission, offer a flat-rate service of $52 from JFK Airport to Manhattan, excluding tips and tolls. Since November 30, 2006, this flat-rate fare (excluding tips and tolls) applies to travel from Manhattan to JFK as well. Depending on the time of day, taxi travel from JFK to Midtown Manhattan can be as quick as 35 minutes or as long as 90 minutes. Door-to-door car service is another popular transportation option. 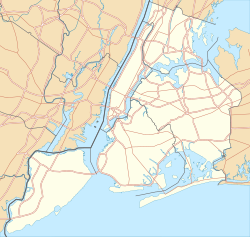 JFK Airport is located in southern Queens on the Van Wyck Expressway (I-678), which can be accessed from the Belt Parkway, the Grand Central Parkway and Queens Boulevard. A ring road connects the airport terminals to the Belt Parkway and the Van Wyck Expressway. The airport offers customers over 17,000 parking spaces, included in multi-level parking garages, surface spaces in the Central Terminal Area, a long-term parking lot and valet parking. Tesla, Inc. has a Supercharger (fast vehicle charging station) at the airport. There are also private off-site parking operators near the airport. Van Wyck Expressway twists through the terminal nucleus and turns into the JFK Expressway. This four-lane expressway allows for more convenient access to the airport for Long Island users via the westbound Belt Parkway. Because it lies almost entirely within Kennedy Airport, the JFK Expressway was constructed and is maintained by the Port Authority. The expressway was built as part of an ongoing, multi-billion-dollar overhaul of Kennedy Airport that began in the late 1980s. It was designed to relieve up to 30 percent of the traffic volume from the Van Wyck Expressway. Approximately six major rental car companies serve JFK Airport, with rental locations located on and off the airport. US Helicopter operated regularly scheduled flights every hour between Terminal 3 and the East 34th Street Heliport. Passengers traveling by helicopter to the airport passed through a security checkpoint at the heliport, not at JFK. On May 14, 2007, US Helicopter moved its operations from Terminal 9 to Terminal 3. US Helicopter temporarily suspended operations on September 25, 2009 due to financial difficulties. New York Airways provided helicopter service from JFK to other area airports and heliports from 1955 to 1979 and Pan American World Airways continued Manhattan helicopter service during the 1980s in order to feed its JFK flights. During the 1970s, New York Helicopter offered JFK flights from the top of the then-Pan Am Building in midtown Manhattan, but this service was cancelled after a major accident in 1977. ^ a b c "Governor Pataki and Mayor Bloomberg Announce Closing of Multi-Billion Dollar Agreement to Extend Airport Leases" (Press release). Port Authority of New York and New Jersey. November 30, 2004. Retrieved August 30, 2015. The Port Authority has operated Idlewild and LaGuardia for more than 55 years. 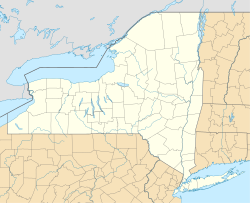 The original 50-year lease [with the City of New York] was signed in 1947 and extended to 2015 under a 1965 agreement. ^ "General Information". The Port Authority of New York and New Jersey. February 2017. Retrieved February 15, 2017. ^ a b "Top 25 U.S. Freight Gateways, Ranked by Value of Shipments: 2008". Bureau of Transportation Statistics. United States Department of Transportation. 2009. Retrieved August 30, 2015. ^ "Airlines". John F. Kennedy International Airport. Port Authority of New York and New Jersey. Retrieved June 27, 2013. ^ "Directory: World Airlines". Flight International. April 3, 2007. p. 86. ^ "Truman, Dewey open airport". The Miami News. Associated Press. August 1, 1948. p. 1. Retrieved August 30, 2015. ^ "Welcome to JFK Airport Guide". JFK Airport Guide. Retrieved June 27, 2013. ^ "N.Y. Airport Has Troubles". Reading Eagle. Reading, Pennsylvania. Associated Press. August 4, 1949. p. 31. Retrieved August 30, 2015. ^ "Idlewild becomes Kennedy". The Age. Melbourne, Australia. December 6, 1963. p. 1. Retrieved August 30, 2015. ^ a b "N.Y. airport takes name of Kennedy". Toledo Blade. Toledo, Ohio. Associated Press. December 25, 1963. p. 2. Retrieved August 30, 2015. ^ Young, Marguerite (November 7, 1943). "New York City begins construction of mammoth airport". The Miami News. NEA. p. 1C. Retrieved August 30, 2015. ^ a b c d e f Trans World Airlines Flight Center (now TWA Terminal A) at New York International Airport (PDF). Landmarks Preservation Commission (Report). July 14, 1994. Retrieved July 7, 2012. ^ "IDLEWILD AIRPORT OFFICIALLY OPENED; Six Foreign Flag Carriers and Two Others Will Not Begin Operations for a Week". The New York Times. July 1, 1948. Retrieved January 2, 2019. ^ "Aviation: Hub of the World". Time Magazine. July 12, 1948. Retrieved July 7, 2012. ^ "Aerial Pic Looking WSW". New York State Archives. December 31, 1949. Archived from the original on July 13, 2012. Retrieved June 2, 2012. 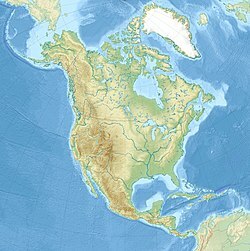 ^ "The lost runway of JFK?". NYCaviation.com. July 21, 2007. Archived from the original on March 7, 2014. Retrieved June 27, 2013. ^ Benjamin, Philip (December 25, 1963). "Idlewild Is Rededicated as John F. Kennedy Airport". The New York Times. Retrieved May 13, 2010. ^ Morgan, Richard (November 21, 2013). "For JFK, the King of Camelot, an Airport in Queens". Wall Street Journal. New York. Retrieved December 24, 2013. ^ FAA Airport Master Record for IDL (Form 5010 PDF). Federal Aviation Administration. Effective November 15, 2012. ^ a b Gordon, Alastair (2014). Naked Airport: A Cultural History of the World's Most Revolutionary Structure. University of Chicago Press. ISBN 978-1-4668-6911-0. ^ Pearman, Hugh (2004). Airports: A Century of Architecture. Laurence King Publishing. ISBN 978-1-85669-356-1. Retrieved August 30, 2015. ^ Airports and Air Carriers August 1948. ^ "Port Authority Prepares John F. Kennedy International Airport for Next Generation of Quieter, More-Efficient Aircraft" (Press release). Port Authority of New York and New Jersey. April 1, 2004. Retrieved March 6, 2010. ^ a b "John F. Kennedy International Airport, United and Delta Airlines Building". ^ "Bigger Than Grand Central". Time Magazine. November 9, 1959. Retrieved July 7, 2012. ^ Ford, Ruth (July 23, 2006). "Demolishing a Celebrated Wall of Glass". The New York Times. Retrieved September 16, 2009. ^ a b "Umbrella for Airplanes". Time Magazine. June 13, 1960. Retrieved July 7, 2012. ^ "JetBlue – Terminal 5 History". JetBlue Airways. October 22, 2008. Retrieved June 2, 2012. ^ "I.M. Pei's JFK". The Architect's Newspaper. Archived from the original on June 19, 2010. Retrieved June 16, 2010. ^ "Port Authority, United Airlines Launch Major Redevelopment of Terminals 5 and 6 at JFK – Project Pushes Total Cost of Kennedy Airport's Record Redevelopment to $10 Billion Mark" (Press release). Port Authority of New York and New Jersey. October 30, 2000. Archived from the original on October 2, 2006. Retrieved May 1, 2009. ^ "Concorde". GlobalSecurity.org. Retrieved July 7, 2012. ^ Witkin, Richard (November 23, 1977). "Concordes From London and Paris Land at Kennedy As 16-Month Trial Passenger Service Is Initiated". The New York Times. Retrieved March 20, 2010. ^ Kilgannon, Corey (October 25, 2003). "Covering Their Ears One Last Time for Concorde". The New York Times. Retrieved March 20, 2010. ^ Chan, Sewell (January 12, 2005). "Train to J.F.K. Scores With Fliers, but Not With Airport Workers". The New York Times. Retrieved July 22, 2016. ^ "Project Profile; USA; New York Airtrain" (PDF). UCL Bartlett School of Planning. September 6, 2011. p. 22. Retrieved July 23, 2016. ^ Dentch, Courtney (April 18, 2002). "AirTrain system shoots for October start date". Times Ledger. Retrieved September 1, 2017. ^ Stellin, Susan (December 14, 2003). "TRAVEL ADVISORY; A Train to the Plane, At Long Last". The New York Times. ISSN 0362-4331. Retrieved December 21, 2016. ^ "To & From JFK". Port Authority of New York and New Jersey. Retrieved February 2, 2017. ^ "JFK Airport AirTrain". Jfk-airport.net. Retrieved May 19, 2014. ^ Vogel, Carol (May 22, 1998). "Inside Art". The New York Times. Retrieved March 20, 2010. ^ "New Terminal 4 Opens at JFK Airport – A Key Element in Port Authorit's $10.3 Billion JFK Redevelopment Program" (Press release). Port Authority of New York and New Jersey. May 24, 2001. Retrieved March 20, 2010. ^ "Port Authority Takes Important Step in Overhaul of Domestic and International Gateways at Kennedy Airport" (Press release). Port Authority of New York and New Jersey. May 22, 2008. Retrieved March 6, 2010. ^ "Emirates A380 Lands at JFK New York". Airwise News. Reuters. August 1, 2008. Retrieved July 7, 2012. ^ "Emirates Airline A380 Emirates to Stop Flying A380s to NY". eTurboNews. March 18, 2009. Archived from the original on July 10, 2011. Retrieved March 11, 2010. ^ Gonzalez, Manny (January 17, 2012). "PHOTOS: Singapore Airlines Upgrades New York JFK Service to Airbus A380 Super Jumbo". NYCAviation.com. Retrieved August 16, 2013. ^ "Qatar's Airbus A350 takes off for US". The Himalayan Times. Himalayan News Service. December 9, 2015. Retrieved December 9, 2015. ^ a b "Police Trying to Determine Cause of J.F.K. Airport Gun Calls". nytimes.com. Associated Press. August 15, 2016. Retrieved August 17, 2016. ^ a b Tracy, Thomas (August 16, 2016). "JFK shooting scare revealed flaws in handling terror attacks". NY Daily News. Retrieved August 17, 2016. ^ Smith, Emily; Melendez, Pilar (August 15, 2016). "JFK airport: All-clear given after report of shots". CNN. Retrieved August 17, 2016. ^ a b Vincent, Barone (January 4, 2017). "Cuomo unveils plan to breathe new life into JFK airport". am New York. Retrieved January 6, 2017. ^ a b Kirby, Jen (January 5, 2017). "New York City's Second-Worst Airport Might Also Get an Upgrade". Daily Intelligencer. Retrieved January 6, 2017. ^ "A Vision Plan for John F. Kennedy International Airport" (PDF). governor.ny.gov. Airport Advisory Panel; Government of New York. January 4, 2017. Retrieved January 5, 2017. ^ "New York launches next stage in JFK Airport overhaul". Deutsche Welle. Reuters and Bloomberg. July 19, 2017. Retrieved September 1, 2017. ^ "Governor Cuomo Announces RFP for Planning and Engineering Firm to Implement JFK Airport Vision Plan". governor.ny.gov. Government of New York. July 18, 2017. Retrieved September 1, 2017. ^ a b c "Cuomo's $13 Billion Solution to the Mess That Is J.F.K. Airport". The New York Times. October 4, 2018. Retrieved October 5, 2018. ^ "New looks at JFK Airport's forthcoming $13B overhaul". Curbed NY. Retrieved October 5, 2018. ^ a b "Governor Cuomo Announces $13 Billion Plan to Transform JFK into a World-Class 21st Century Airport". governor.ny.gov. Government of New York. October 4, 2018. Retrieved October 5, 2018. ^ a b Rivoli, Dan. "Kennedy Airport to get $13 billion renovation and two new terminals". New York Daily News. Retrieved October 5, 2018. ^ "Cuomo: JFK Airport renovation includes central hub, 2 new terminals". Newsday. Retrieved October 5, 2018. ^ "New York and New Jersey Airports". May 18, 2009. Archived from the original on May 24, 2009. Retrieved May 18, 2009. ^ "Survey: JetBlue is Best Low-Cost Carrier". NBC News. Associated Press. June 30, 2006. Retrieved September 16, 2009. ^ "Terminal One Group website". Jfkterminalone.com. Archived from the original on February 24, 2012. Retrieved June 2, 2012. ^ a b "Aviation". www.jfkairport.com. Retrieved March 26, 2018. ^ a b "Aviation Projects". William Nicholas Bodouva and Associates. Retrieved June 13, 2012. ^ "Final Flight of the Concorde". CBS News. Retrieved October 2, 2018. ^ "JFK Airport – Terminal 1". www.airport-jfk.com. Retrieved October 2, 2018. ^ "JFK Terminal 2 info". airport-jfk.com. Retrieved August 14, 2017. ^ "John F. Kennedy International Airport". Skidmore, Owings and Merrill. Archived from the original on May 30, 2012. Retrieved June 13, 2012. ^ "Delta opens new JFK Terminal 4 hub". Queens Chronicle. Retrieved May 31, 2013. ^ Cooper, Peter (November 24, 2010). "John F. Kennedy Airport in New York Commences Terminal 4 Expansion Project". WIDN News. Archived from the original on November 28, 2010. Retrieved November 24, 2010. ^ a b Minutes (PDF) (Report). Port Authority of New York and New Jersey. February 6, 2013. Archived from the original (PDF) on November 26, 2013. Retrieved August 30, 2015. ^ Hawley, Chris (January 31, 2012). "World Trade Center Design Flaw Could Cost Millions". NBC New York. Associated Press. Retrieved February 1, 2012. ^ "ASIANA AIRLINES Moves Forward A380 New York Service from late-May 2015". AirlinerRoute.net. Retrieved August 30, 2015. ^ "Etihad announce Airbus A380 flights to New York JFK". Retrieved March 4, 2015. ^ "New Hawaiian – JetBlue Partnership Brings Hawaii Closer to East Coast Cities" (Press release). Hawaiian Airlines. January 23, 2012. Retrieved July 7, 2012. ^ "JetBlue Airways Opens International Arrivals Concourse at Its Award-Winning Terminal 5 at John F. Kennedy International Airport". Marketwire. ^ "TAP Portugal to introduce daily non-stops to Lisbon on new A330 aircraft from New York's JFK and Boston Logan Airports". TAP Portugal. February 22, 2016. Retrieved June 5, 2016. ^ "JetBlue Airways Opens International Arrivals Concourse at Its Award-Winning Terminal 5 at John F. Kennedy International Airport" (Press release). New York: JetBlue Corporate Communications. MarketWired. November 12, 2014. Retrieved November 13, 2014. ^ "Airspace Lounge Opens at JFK Airport's JetBlue Terminal". Huffington Post. Retrieved February 23, 2015. ^ "Aer Lingus Offers New Experiences". The Guardian. Retrieved February 23, 2015. ^ "Yahoo Message about T5". Yahoo! Finance. Archived from the original on September 3, 2016. Retrieved August 31, 2016. ^ "JetBlue gives makeover to T5 at its New York JFK hub". usatoday.com. Retrieved January 7, 2018. ^ "JFK Airport". GMW Architects. Archived from the original on October 11, 2012. Retrieved June 13, 2012. ^ "Qatar Airways Terminal – JFK Airport". www.airport-jfk.com. Retrieved March 23, 2018. ^ "Interjet Terminal – JFK Airport". www.airport-jfk.com. Retrieved March 23, 2018. ^ Airport Traffic Report (PDF). Port Authority of New York and New Jersey (Report). 1998. Retrieved June 13, 2012. ^ a b "JFK Facts and History". Port Authority of New York and New Jersey. Archived from the original on March 19, 2007. Retrieved July 7, 2012. ^ Dunlap, David W. (October 26, 1997). "A 'New' Kennedy Airport Takes Wing". The New York Times. Retrieved June 13, 2012. ^ "Minutes" (PDF). Port Authority of New York and New Jersey. May 22, 2008. Archived from the original (PDF) on May 27, 2010. Retrieved June 13, 2012. ^ "UPDATE: BA reveals New York JFK T7 modernisation and retail plan". www.dfnionline.com. Retrieved September 2, 2018. ^ a b "BA plans $65m JFK terminal upgrade, but is it enough? – Runway Girl". Runway Girl. November 27, 2016. Retrieved September 2, 2018. ^ a b Belson, Ken (February 22, 2008). "A Window That Reflected a Golden Age Comes Down at Kennedy Airport". The New York Times. Retrieved April 3, 2014. ^ "LAN Airlines Moves into Terminal 8 at JFK With American Airlines" (Press release). American Airlines. January 31, 2012. Retrieved July 7, 2012. ^ "Airport News – Terminal 8 Opens at JFK". Port Authority of New York and New Jersey. October 1, 2007. Retrieved June 2, 2012. ^ "Airport Map". John F. Kennedy International Airport. Port Authority of New York and New Jersey. Retrieved July 7, 2012. ^ Perez-Pena, Richard. "4 Airlines Sign Kennedy Deal For a Terminal". Retrieved October 2, 2018. ^ Frischling, Steven. "Photographer". Retrieved June 1, 2013. ^ "Port Authority Approves Construction of New State-of-the-Art Terminal Space for Delta Air Lines at JFK Airport" (Press release). Port Authority of New York and New Jersey. August 5, 2010. Retrieved August 5, 2010. ^ "New Plans For Expanding Terminal 4 at JFK Airport" (Press release). City of New York, Office of the Mayor. August 5, 2010. Retrieved August 5, 2010. ^ "Delta Air Lines, the Port Authority of New York and New Jersey and JFK International Air Terminal Unveil Plans for Enhancement and Expansion of Terminal 4 at JFK Airport" (Press release). Delta Air Lines. August 11, 2010. Retrieved August 11, 2010. ^ "Details of JFK Improvements – Civil Aviation Forum". Airliners.net. August 5, 2010. Retrieved August 11, 2010. ^ Romeo, Jim (October 19, 2008). "JetBlue's New T5 Terminal at JFK Airport". Construction Equipment. Retrieved July 7, 2012. ^ "Stats & Facts". Delta Air Lines. Archived from the original on June 19, 2015. ^ "1973 Results". 1973 Braniff International Annual Report: 14. 1973. ^ FAA Airport Master Record for JFK (Form 5010 PDF), effective March 1, 2018. ^ "KJFK/JFK". AirNav. Retrieved July 7, 2012. ^ "JFK closure to rattle nerves, wallets". MSNBC. Associated Press. March 2, 2010. Retrieved August 30, 2015. ^ Miranda, Maria Eugenia (June 29, 2010). "JFK's Longest Runway Re-opens". NBC New York. ^ "Press Release Article – Port Authority of NY & NJ". Panynj.gov. Retrieved July 2, 2017. ^ a b "FAA Air Traffic Control Tower, JFK International Airport". Pei Cobs Freed & Partners, Architects. Retrieved July 7, 2012. ^ Hanseder, Tony. 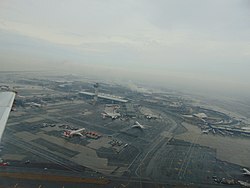 "New York Kennedy JFK Airport Overview". ifly.com. Retrieved May 2, 2012. ^ a b "Table 1: Tenant Activity Summary" (PDF). Port Authority of New York and New Jersey. p. 3. Retrieved September 13, 2011. "Building 141 – Multi-tenant (North American Airlines / Globe Ground / VOA / Port Authority Storage)"
^ a b "Annex To Aviation HS Opens at JFK". Daily News (New York). October 26, 2000. Retrieved September 13, 2011. ^ McKinley, Jr., James C. (July 9, 1994). "Port Authority Officer Hurt in Airport Scuffle". The New York Times. Retrieved September 13, 2011. ^ "Building Dedicated to Aviation Veteran and School Contest Winners Announced" (Press release). Port Authority of New York and New Jersey. December 17, 2003. Retrieved September 13, 2011. ^ Flight International. April 10, 1976. p. 947. "Head Office: Kennedy International Airport, Jamaica, New York 11430, United States." ^ "World Airline Directory". Flight International. April 3, 1982. Head Office: Building 178, JFK International Airport, Jamaica, New York 11430, United States. ^ Mayerowitz, Scott (November 26, 2013). "Airport chaplains help fliers reach Heaven". The Denver Post. Archived from the original on May 25, 2014. Retrieved August 2, 2016. ^ Epstien, Curt (May 22, 2012). "Sheltair Opens First Privately Operated FBO at JFK". Aviation International News. Retrieved June 23, 2014. ^ Levere, Jane L. (March 21, 2017). "Jet-Setting Pets Get a New Place to Be Pampered at Kennedy Airport". The New York Times. ISSN 0362-4331. Retrieved January 24, 2018. ^ Bagli, Charles V. (2018). "A$65 Million 'Animal Terminal' at Kennedy Airport Sits Empty". The New York Times. ISSN 0362-4331. Retrieved January 24, 2018. ^ "Port Authority Ready for Labor Day Weekend Travel" (Press release). Port Authority of New York and New Jersey. August 25, 2003. Retrieved March 8, 2010. ^ "About My Services". Bernie Wagenblast Voice Services. Retrieved March 8, 2010. ^ "Ramada Plaza Hotel JFK International Airport". CHM (Capital Hotel Management) Properties. Capital Hotel Management. Archived from the original on November 4, 2012. Retrieved November 4, 2012. ^ Adamson, April (September 4, 1998). "229 Victims Knew Jet Was in Trouble Airport Inn Becomes Heartbreak Hotel Again". Philadelphia Inquirer. Retrieved March 9, 2014. ^ "Hotel Near JFK Airport is Familiar With Airline Tragedy". CNN. November 17, 2011. Archived from the original on March 8, 2014. Retrieved March 9, 2014. ^ Governor's Press Office (July 27, 2015). "Governor Cuomo Unveils Vision for Transformative Redesign of LaGuardia Airport" (Press release). State of New York. Retrieved August 18, 2015. ^ Plitt, Amy (December 15, 2016). "TWA Terminal hotel celebrates groundbreaking with a new rendering". Curbed NY. Retrieved December 26, 2017. ^ "Online timetable". Aeroflot. Retrieved August 5, 2018. ^ "Flight Schedules". Retrieved August 5, 2018. ^ a b "Flight Schedule". Aeroméxico. Retrieved August 5, 2018. ^ "Flight Timetable". Retrieved August 5, 2018. ^ "Air Europa Map". Archived from the original on August 5, 2018. Retrieved August 5, 2018. ^ "Time Table – Air India". Retrieved August 5, 2018. ^ "Air Italy – Timetable". Retrieved August 5, 2018. ^ "Flight Schedule | Timetable". Retrieved August 5, 2018. ^ "FLIGHT SCHEDULE AND OPERATIONS". Retrieved August 5, 2018. ^ "Timetables [International Routes]". Retrieved August 5, 2018. ^ Ltd. 2019, UBM (UK). "American adds New York JFK – Georgetown service in mid-December 2019". AirlineGeeks. ^ Ltd. 2019, UBM (UK). "American ends New York JFK – Orlando service in early-May 2019". Routesonline. ^ "American Airlines Cancels Flights to Brazil". The Brasilians. April 10, 2018. Retrieved April 3, 2019. ^ a b "Flight schedules and notifications". Retrieved August 5, 2018. ^ "Routes of Service". Archived from the original on March 17, 2018. Retrieved August 5, 2018. ^ a b "Check itineraries". Retrieved August 5, 2018. ^ a b ""Avianca Holdings cancela 10 rutas internacionales y una nacional"". Retrieved March 22, 2019. ^ "Timetable". Retrieved August 5, 2018. ^ "Timetable | Brussels Airlines". Retrieved August 5, 2018. ^ "New York-JFK". Cape Air. Retrieved August 29, 2018. ^ "Caribbean Airlines Route Map". Retrieved August 5, 2018. ^ "Flight Schedule". Retrieved August 5, 2018. ^ "Timetable | China Airlines". Retrieved August 5, 2018. ^ a b "FLIGHT SCHEDULES". Retrieved August 5, 2018. ^ "EGYPTAIR – Timetable". Retrieved August 5, 2018. ^ "Flight Timetables". Etihad Airways. ^ Ltd. 2019, UBM (UK). "Ethiopian New York service changes from mid-June 2019". Routesonline. ^ "Finnair flight timetable". Retrieved August 5, 2018. ^ "Flight Schedule". Hainan Airlines. ^ "Destinations". Retrieved August 5, 2018. ^ "Flight times – Iberia". Retrieved August 5, 2018. ^ "Japan Airlines Timetables". Retrieved August 5, 2018. ^ Ltd. 2019, UBM (UK). "JetBlue plans new A321neo route to Ecuador". Routesonline. ^ "JetBlue Airlines Timetable". Retrieved August 5, 2018. ^ "Timetable – Kenya Airways". Retrieved August 5, 2018. ^ "Flight Map". Retrieved August 5, 2018. ^ a b c "Flight Status – LATAM Airlines". Retrieved August 5, 2018. ^ "LEVEL adds new Barcelona Trans-Atlantic routes in NS19". Routesonline. Retrieved November 17, 2018. ^ "Timetables". LOT Polish Airlines. ^ "Timetable – Lufthansa Canada". Lufthansa. ^ Mutzabaugh, Ben (February 15, 2019). "Norwegian Air adds new Athens, Barcelona routes; fares from $159". USA Today. Gannett Satellite Information Network, LLC. Retrieved February 15, 2019. ^ "Norwegian Air Shuttle Destinations". Retrieved August 5, 2018. ^ "Qantas Timetable". Retrieved April 6, 2019. ^ "Qantas Timetables". Retrieved August 5, 2018. ^ "Route Map". Royal Jordanian Airlines. Retrieved August 5, 2018. ^ "Flight Schedule Timetables". Archived from the original on April 11, 2018. Retrieved August 5, 2018. ^ "Timetable – Thomas Cook Airlines". Retrieved August 5, 2018. ^ "TRANSFER PROGRAMME FOR ISTANBUL AIRPORT (LTFM) 3" (PDF). ^ "Timetable – Ukraine International Airlines". Retrieved August 5, 2018. ^ "Interactive flight map". Retrieved August 5, 2018. ^ "Our Destination | VivaAerobus". Retrieved August 5, 2018. ^ "Volaris Flight Schedule". Retrieved August 5, 2018. ^ "Route Map". Retrieved August 5, 2018. ^ "Xiamen Flight Schedule & Timetable". Retrieved August 5, 2018. ^ "XL Airways déménage son Paris – New York vers Newark". Retrieved February 17, 2019. ^ "Qantas Timetable". Retrieved April 7, 2019. ^ Ben (March 14, 2019). "Air India Adjusts US Flights Due To Pakistan Airspace Closure". One Mile at a Time. ^ "Value and Weight of U.S. International Merchandise Freight: 2008". United States Department of Transportation. 2009. ^ "Unique Foreign Trade Zone Status". Port Authority of New York and New Jersey. Archived from the original on May 18, 2009. Retrieved July 7, 2012. ^ a b c d Bureau of Transportation Statistics (2004). "America's Freight Transportation Gateways" (PDF). U.S. Department of Transportation. Archived (PDF) from the original on September 27, 2006. Retrieved February 18, 2007. ^ "Monthly Summaries of Airport Activities". Port Authority of New York and New Jersey. Archived from the original on July 10, 2007. Retrieved August 2, 2007. ^ "Air Cargo Facilities at John F. Kennedy International Airport". Port Authority of New York and New Jersey. Retrieved August 30, 2015. ^ "American Airlines Cargo Opens New Priority Parcel Service Facility at New York's Kennedy International Airport" (Press release). American Airlines. October 16, 2007. Retrieved February 5, 2010. ^ "Air China Cargo Routes". Air China Cargo. Retrieved June 26, 2013. ^ "TNT Flights to JFK". Flight Mapper. July 6, 2013. Retrieved July 6, 2013. ^ "Cargolux Schedule: JFK-LUX". Cargolux. Archived from the original on September 27, 2013. Retrieved July 6, 2013. ^ "Cathay Pacific cargo schedule". Cathay Pacific Cargo. Retrieved May 1, 2013. ^ "China Airlines cargo schedule" (PDF). China Airlines Cargo. Archived from the original (PDF) on May 16, 2013. Retrieved May 1, 2013. ^ "Emirates SkyCargo Global Network". Emirates SkyCargo. Retrieved June 28, 2013. ^ "Emirates SkyCargo Freighter Operations get ready for DWC move" (Press release). Emirates SkyCargo. April 2, 2014. Retrieved August 30, 2015. ^ "FedEx Express". FedEx Express. Retrieved June 28, 2013. ^ "Korean Air cargo schedule". Korean Air. Archived from the original on December 27, 2011. Retrieved May 1, 2013. ^ "Lufthansa cargo schedule (CSV)". Lufthansa Cargo. Archived from the original on June 16, 2013. Retrieved May 1, 2013. ^ "NCA Flight Schedule" (PDF). Nippon Cargo Airlines. June 28, 2013. Retrieved June 28, 2013. ^ "Qantas Freight: flight information". Qantas. May 1, 2013. Retrieved May 1, 2013. ^ O'Sullivan, Matt (March 7, 2013). "Qantas Mulls Buying 747 Freighters". Sydney Morning Herald. Retrieved March 7, 2013. ^ "Qatar Airways Cargo Adds Halifax Service from July 2016". June 3, 2016. Retrieved June 4, 2016. ^ "Saudia Cargo Resumes New York Service from Sep 2015". Airlineroute.net. September 23, 2015. Retrieved September 23, 2015. ^ "Turkish Cargo adds 7 destinations in Jan 2018". Routesonline.com. Retrieved December 31, 2017. ^ December 2013 Traffic Report (PDF) (Report). Port Authority of New York and New Jersey. February 12, 2014. p. 1. Retrieved February 17, 2014. ^ a b "Facts and Information". Port Authority of New York and New Jersey. Archived from the original on July 29, 2008. Retrieved July 30, 2008. ^ "U.S. International Travel and Transportation Trends, BTS02-03" (PDF). Bureau of Transportation Statistics, U.S. Department of Transportation. 2013. Archived from the original (PDF) on January 10, 2014. Retrieved November 16, 2013. 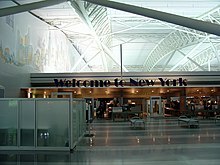 ^ "New York, NY: John F. Kennedy International (JFK)". Bureau of Transportation Statistics. U.S. Department of Transportation. February 2018. Retrieved February 14, 2018. ^ Office of the Assistant Secretary for Aviation and International Affairs (October 2018). U.S.-International passenger Raw Data for Calendar Year 2016 (PDF) (Report). US Department of Transportation. Retrieved December 16, 2018. ^ Traffic Report (PDF) (Report). Port Authority of New York and New Jersey. January 2019. Retrieved April 6, 2019. ^ "Airport Shuttle Bus Archived March 6, 2016, at the Wayback Machine." China Airlines. Retrieved on February 29, 2016. ^ "Service to Connect PA & NJ." EVA Air. Retrieved on February 29, 2016. ^ Airport Plazas. "AP enters into an agreement with Tesla Motors to install a 4 post Supercharger at our JFK International Airport Plaza – Airport Plazas". Web.archive.org. Archived from the original on August 14, 2014. ^ "JFK Expressway – Historic Overview". Eastern Roads Website. Retrieved July 7, 2012. ^ "Delta Cuts Travel Time between Manhattan and JFK to Just Eight Minutes with US Helicopter's Airport Shuttle Service" (Press release). Delta Airlines. May 10, 2007. Retrieved August 30, 2015. ^ McGeehan, Patrick (September 25, 2009). "U.S. Helicopter Halts Shuttle Service to J.F.K. and Newark". The New York Times. Retrieved September 26, 2009. ^ McGeehan, Patrick (February 6, 2006). "New Helicopter Service Promises Wall St. to J.F.K., in 9 Minutes". The New York Times. Retrieved September 16, 2009. Bloom, Nicholas Dagen. The Metropolitan Airport: JFK International and Modern New York (University of Pennsylvania Press, 2015). x, 233 pp.